This is the first time Mackmyra has presented a seasonal whisky with Amarone cask finishing. Using the complex and unique flavours of this wine, gives this latest edition a soft and spicy character that is suited to autumn and winter. – When I visited the Italian wine producer Masi one winter, I felt immediately that here was a company whose values and methods matched Mackmyra’s. It wasn’t hard to sell the idea of creating a whisky with an Amarone finish to our Master Blender Angela D’Orazio, who has Italian ancestry, says Carl Klingberg, Mackmyra´s chairman of the board. 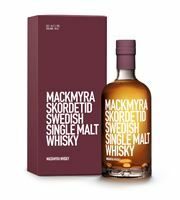 Skördetid is an elegant Swedish single malt whisky partially matured in Italian Amarone casks, Masi Costasera Amarone, but which has kept the original character of Mackmyra’s whisky casks. The whisky was initially matured in the Bodås mine in Sweden in Mackmyra casks, and, to finish the whisky, a high proportion spent a final six months in the Masi 600 litres oak barrels. The aroma is spicy, fruity and herbal with warm vinous grape notes and a slightly mineral tone. On the palette, the flavours are fruity and spicy with raisins and dried pears, as well as ginger and vanilla. The mouthfeel is creamy and medium bodied. The long finish is fruity and spicy with notes of oak and warm raisins. – It is fascinating to see how our casks, where for a long period Masi Costasera has been aged, have transferred their character and specific aromas from our unique wine to another unique product. When comparing the two products separately, the tastes are completely different, but the whisky finished in our casks has Costasera’s distinct flavours of dark cherries in combination with its typical fruitiness, the herbal notes, together with the flavour of vanilla fudge from Mackmyra, says Raffaele Boscaini, Masi Technical Group. The dark wine-red colour of Masi Costasera Amarone can also be seen on the bottle’s stopper and in the packaging. Skördetid has a natural colour that comes from its maturation in the wine casks. Skördetid is a whisky that comes into itsown in the darker autumnal and winter evenings. It can be enjoyed just as it is or as an accompaniment to a fine dessert. Skördetid, released as a limited edition, will be available at selected export markets and at the Swedish liquor shops, Systembolaget. The history of Masi Agricola is the history of a family and its vineyards located on the hilly countryside around Verona. The company name comes from “Vaio dei Masi”, the small valley acquired by the Boscaini family at the end of the XVIII century, who still owns it to these days. Masi’s President, Sandro Boscaini, is known the world over as “Mister Amarone”, in recognition of the way he has made Masi Amarone into an icon of Italian excellence. Masi makes premium quality wines that are expressions of the values of their region of origin (Venetian Values), using grapes and methods that are indigenous to the region and applying constant technological updates. Masi has recognised expertise in the Appassimento technique and is considered a leader in the production of Amarone. Masi Costasera Amarone is produced in the Valpolicella Classica region, in northern Italy. The vineyards lie on slopes overlooking Lake Garda and its sunset vistas. The days are longer because of the reflection of the light and the milder climate, which produces the best possible conditions for Amarone. Masi Cosasera Amarone is matured 28-30 months with 80% aged in Slavonian oak barrels of 40-80 hl and 20% in small Allier and Slavonian oak barrels (40% new, 30% second usage, 30% third usage). The wine is then bottle-aged for a minimum of 4 months. 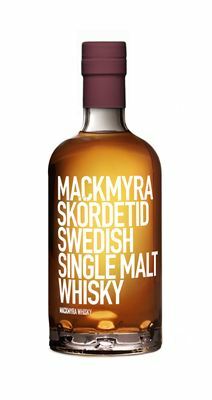 Mackmyra Swedish Whisky is the pioneer and innovator who started the Swedish whisky expedition. The whisky is created with Swedish ingredients, with no additives, and by a climate friendly distillation technique. Mackmyra offers award-winning single malt whiskys, exciting whiskey experiences and the opportunity to create your own whisky through a personal 30-liter cask. Welcome to Mackmyra Whisky. Mackmyra's shares are traded on NASDAQ OMX First North. Certified Adviser is Erik Penser.